“Food is not my life,” Bistro 222’s new chef, David Bible tells me over lunch at Avenues Proper as we bond over our mutual dislike of beets. “Food is my job.” Bible is a long-time fixture in Salt Lake’s emerging dining scene and is currently bringing fresh flavors and culinary excellence to this downtown dining hotspot. But despite his insistence to the contrary, food seems to have chosen Bible for a higher purpose. “I just took to it but I never wanted to cook,” he recalls. “I wanted to be a radio DJ.” Even with a stint at that dream job in the Pacific Northwest, Bible has been firmly rooted in the kitchen since he was 16. 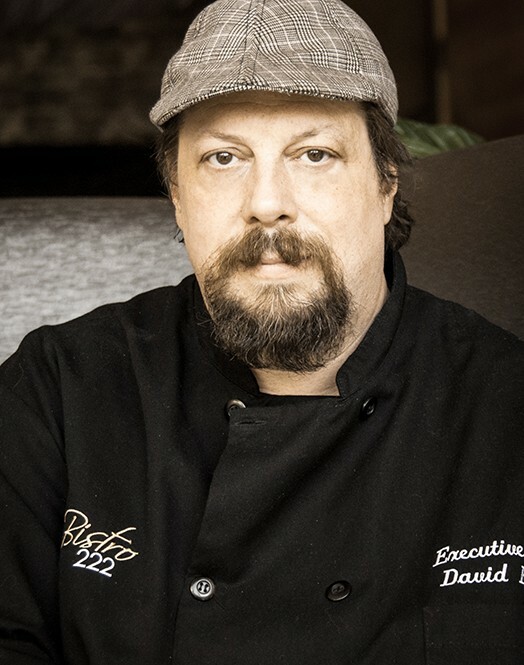 His culinary career began at a Wendy’s but it didn’t take long for it to blossom into something that at times reflects his upbringing in Memphis (fried chicken on the Bistro 222 lunch menu) and Seattle (the geoduck appetizer special at dinner). As an adult, Bible’s adventures brought him to Salt Lake and a job at Caffé Molise where he came to understand that he wasn’t ready to open his own restaurant as he had originally planned. 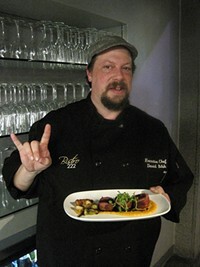 Instead, he headed to Vancouver, British Columbia to attend culinary school. In 2006, he returned to Utah and Caffé Molise. Molise's sister restaurant, Sego Lily Cafe in Bountiful, opened with Bible at the helm in 2007. 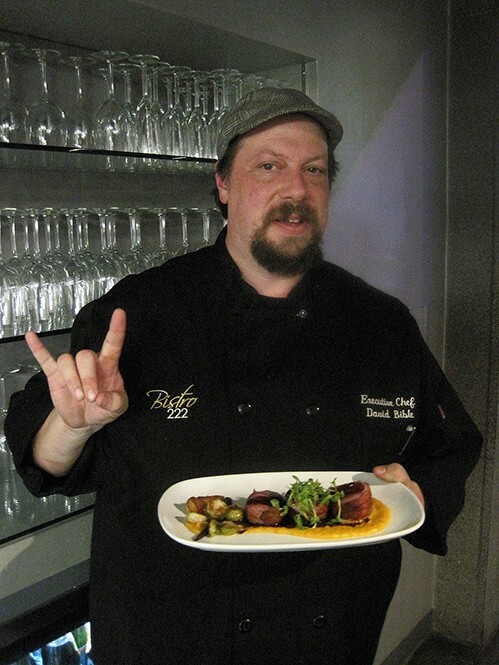 When Sego Lily closed, he accepted a position at Silver Star Café in Park City where he eventually appeared on Diners, Drive-Ins & Dives. The Triple D experience, says Bible who eschewed the hype that followed, brought about one really cool result—he located both of his birth parents. Two decades ago, Bible had signed up for an adoption registry that would match parents and children searching for each other. He got no results the few times he had previously checked but updated his search just before the Triple D episode aired. From their respective homes in California and Arkansas both of his birth parents recognized him immediately as their son. “I look just like my dad,” explains Bible. “That was a good bit from the show.” He plans to meet them each in person this year. 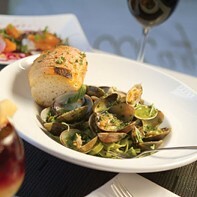 That environment is the driving force behind the dramatic change in menu direction at Bistro 222. Gone are the suburban standards of sweet potato fries and the gelato case—replaced by bread from Moore Bread and cheeses and chocolates from Caputo’s. Bible has deftly transformed the Bistro 222 lunch and dinner menus into urban offerings designed for business lunches and pre-Capitol Theatre performances. In his life outside of food, the former disk jockey is a celebration of contradictions. His dislike of cats is belied by the six furry felines (collected by his wife, brother and mother-in-law) who adore him. Rush is his favorite band. His Libertarian streak means he’s never voted for a Republican or Democratic presidential candidate but did have lunch with George Bush Sr. when he was 14. He’s an avid collector of historic literature—owning a first-edition copy of Tarzan—and studies the Roman Empire and the American Revolution in his free time. As Bible politely lets me finish off all the pickles from our small plates, he shares a final thought. “I’m passionate about doing a good job. I tell my line: that couple that just came in chose our restaurant over every other restaurant. They have a right to expect the very best.” And Bible does his best to deliver perfection on every plate.